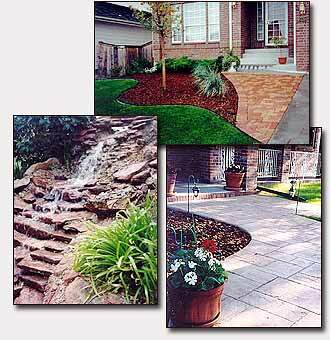 Commercial and residential landscaping, walls, pavers, patios, ponds, fountains, & irrigation systems. Denver, CO area. Centennial landscape is an award winning full service landscape construction company serving the front range of Colorado for over a decade. We are proud to be certified installers of pavers, retaining walls, xeriscape, landscape, and irrigation. We have constructed numerous custom stone installations and water features utilizing flagstone, moss rock, other decorative native rock. Through a network of associates we can also assist with any fencing, concrete, stamped concrete, decking, concrete curb, and lighting projects. Please use our online estimator to assist you with any project planning needs. Estimates are always free and we look forward to working with you. © Copyright 2003, Centennial Landscaping, Inc.
Commercial and residential landscaping, walls, pavers, patios, ponds, fountains, & irrigation systems. Based in Denver, CO.